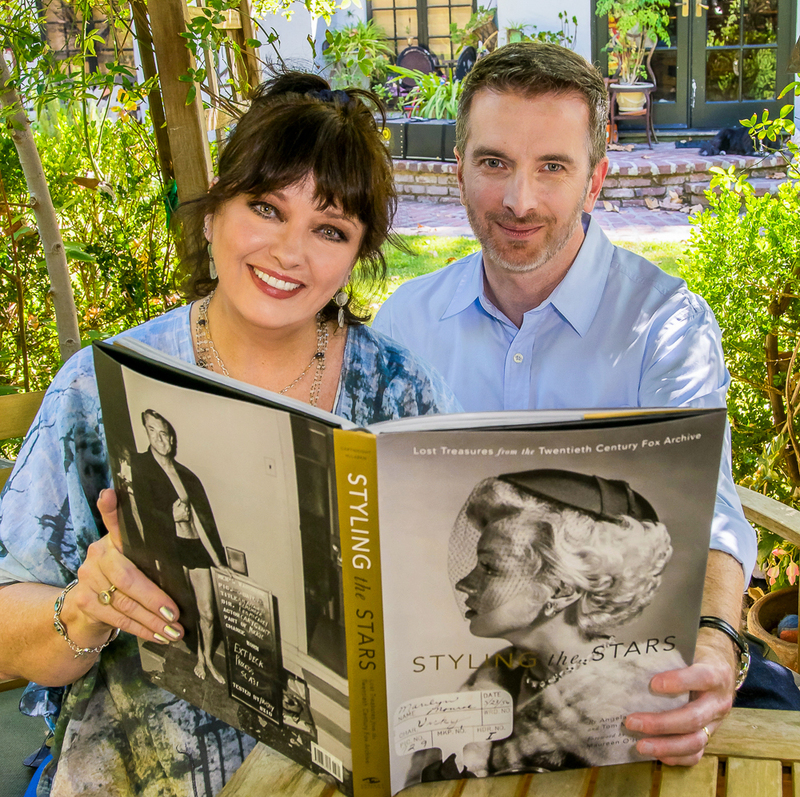 As the authors of "Styling The Stars", you both spent hours pouring over photographs of Hollywood icons in the Twentieth Century Fox archive. Which star most captivated you? AC: When I laid eyes on the image that became the cover I said "Oh please let us be able to use this Marilyn Monroe picture on the cover." It embraced the whole feel of the book in one photograph-- classic movies, fashion, romance, glamour, movie stars! TM: I loved finding never-before-seen pictures of Ann-Margret, a personal favorite of mine, because you see her transformation from shy movie ingenue in 1961 for State Fair to captivating movie star in 1964 for The Pleasure Seekers. But the biggest revelation was definitely Marlon Brando in The Young Lions. My image of him is the "serious" iconic actor, so finding candid wardrobe shots of him smiling and having fun was quite unexpected. The research process for your book required you to be immersed in Hollywood film history. What film classics were you inspired to watch after this experience? AC: After reading the wonderful forward Maureen O'Hara wrote for our book, I was inspired to watch Miracle on 34th Street for the 50th time. What a classic, and so is Miss O'Hara. TM: It was interesting to discover that virtually every major movie star has done at least one film for Fox. I loved the photos from The Sun Also Rises, so I just watched it and discovered amazing performances from Errol Flynn and Ava Gardner. Next on my to-do list is the original Titanic with Barbara Stanwyck. The James Cameron version is so memorable, but I have to see the original version that was shot decades earlier on the Fox lot itself. What was the biggest surprise you encountered while researching and/or writing "Styling The Stars"? AC: Just the pure vastness of images was quite a surprise. We've been told some eight million unique images are housed in the archives on the Fox studio lot. In the book, I talk about the amazing journey of some of those images. TM: The biggest surprise was simply finding stacks and stacks of priceless rare negatives from every film, even the more obscure movies. These old images were not digitized. We literally blew dust off the old boxes, put on protective gloves, and handled the negatives one by one. I got a sense that we were the first people to touch these images, which have been hidden since they were created. We were quite literally touching "movie history". After spending so much time studying and analyzing Hollywood glamour, have you found your personal fashion style has changed? AC: I think I'm grateful that I don't have to wear those heavy uncomfortable costumes in real life. Show business always appears so glamorous, but it's really hard work, especially filming a period piece or standing on a slant board between takes so as not to wrinkle or crease the costume you are wearing. I think this book sheds some light on the amount of people that it takes to make a movie. It's wardrobe, hairdressers, and makeup working together that help create a character with the director, writer and actor. It takes a clan to make a movie. TM: I wish I had the classic movie star looks of Cary Grant and Paul Newman! I try to pose with style when continuity photos are taken of me on my recent acting gigs. But I'm very aware of how it's all changed to quick'n'dirty disposable digital photos. Photos are now shot on cell phone cameras in whatever dimly lit space wherever I'm standing. This is a sharp contrast to the grand days when Fox stars were often perfectly posed and lit in the (long gone) Fox photo studio department.